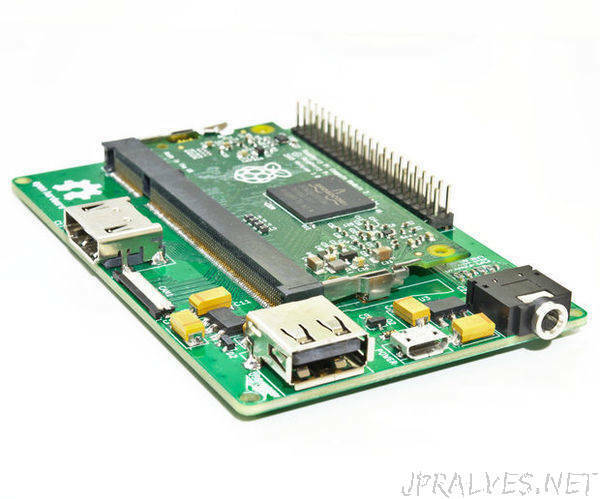 “If youve never heard of the Raspberry Pi Compute Module before, its basically a fully fledged Linux computer with the form factor a laptop RAM stick! With it becomes possible to design your own custom boards where the Raspberry Pi is just another component. That gives you an enormous amount of flexibility as it allows you to have access to a much greater amount of IO pins, while the same time you get to choose exactly what hardware you want on your board. The on-board eMMC also eliminates the need for an external micro SD card, which makes the Compute Module perfect for designing Raspberry Pi based products. Unfortunately, while the Compute Module allows you to do all this it still appears to be lacking in terms of popularity compared to the traditional Raspberry Pi Model A and B. As a result, there arent many open source hardware projects out there based on it. And for anyone who might want to get started with designing their own boards the amount of resources they have is rather limited. When I first got started with the Raspberry Pi Compute Module a few months ago, that was exactly the issue I was faced with. So, I decided to do something about it. I decided to design an open source PCB based on the Compute Module, that is going to have all the basic features that make the Raspberry Pi great. That includes a camera connector, USB host, audio output, HDMI and of course a GPIO header compatible with the regular Raspberry Pi boards. The goal of this project is to provide an open source design for a Compute Module based board, that anyone will be able to use as a starting point for designing their own custom board. The board was designed on KiCAD, an open source and cross platform EDA software package, in order to allow as many people as possible to take advantage of it.